Each summer the Crested Butte Kickers adult soccer team opens the competitive season with the annual Grand Junction Hotter Than Hell tournament. The team reached a milestone last year as they won the tournament. This time around they reached a different milestone: limited numbers and a rash of injuries left the Kickers in disarray. Last year the Kickers took the tournament by storm, winning the title. As a result, they were thrown into the top-tier bracket for the tournament this year. The downside was that several players from last year’s championship team were missing and they scrambled to find players for the weekend. The team’s local core was there with Brian Fenerty, Dana Shellhorn, Ryan Abbott, Kaleb Schultz, Graham Koval, Isaac Evans, Jorge Rodriguez and Prawit Durgan making the trip and they picked up additional players from throughout Colorado. “I had nine going in and we picked up players where we could,” says 30-year veteran player/manager Brian Fenerty. 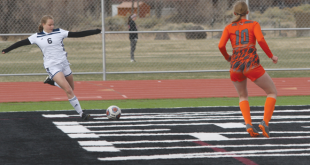 They opened the weekend against Breckenridge on Saturday morning and took a 1-0 lead on a goal from one of the aforementioned pick-up players. But as the game wore on, the Kickers wore down and Breckenridge managed to score to close the game with a 1-1 draw. “We had a team and were playing well,” says Fenerty. The Kickers then took the field just after high noon to face the GJ Cruisers, a local Grand Junction team of hot-shots. The Kickers did what they could to remain in contention through the first half down just 1-0, but with a total of just 13 players and people dropping like flies, the Kickers sputtered to a halt as the Cruisers tacked on four more goals for the 5-1 win. “We just faded,” says Fenerty. The Kickers limped their way to the party Saturday evening and after an assessment of the team’s situation, a decision was made to forfeit Sunday’s match. This decision had never crossed the mind of a Kickers team in the long and storied history of the club. 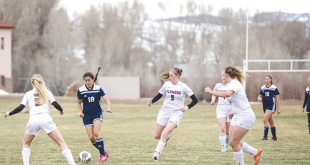 The team hopes to generate interest over the next two weeks as they prepare for the upcoming local adult coed tournament, the Crested Butte Soccer Invitational, put on by the West Elk Soccer Association June 16-17. Anyone interested should show up for pick-up soccer Tuesdays and Thursdays at the Center for the Arts field at 6 p.m. Look for Koval or Durgan as they are putting the home team together.